24 Mar, 2015 Rakesh Sharma Reviews . Recently have seen a many, high wattage power supply releases from many manufacturers like Corsair, Cooler Master, Seasonic and Antec. 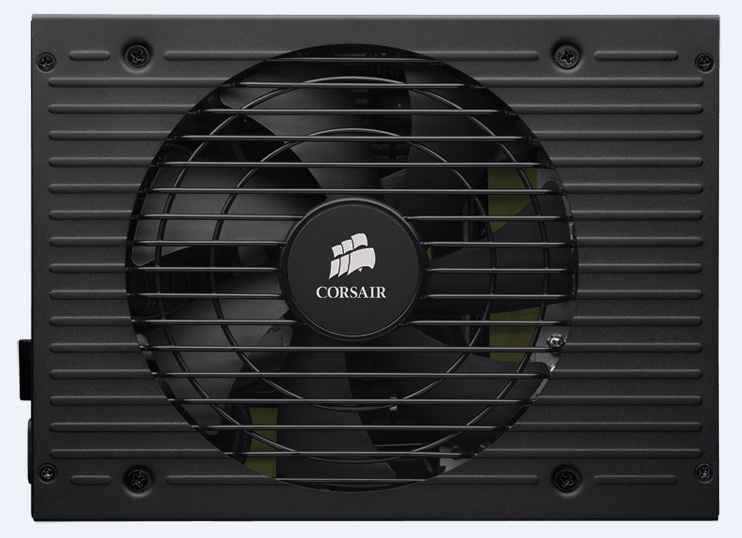 Continuing this trend – today we are reviewing Corsair AX1200i, a modular, 80 Plus Platinum certified model with a Zero RPM Fan Mode to reduce noise emissions as far as possible. 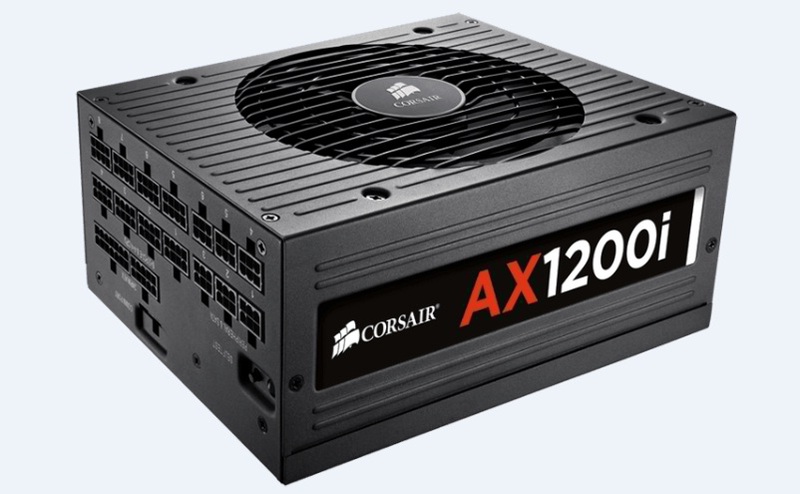 AX1200i is the first desktop PC power supply to use digital (DSP) control and Corsair Link to bring you an unprecedented level of monitoring and performance customization. 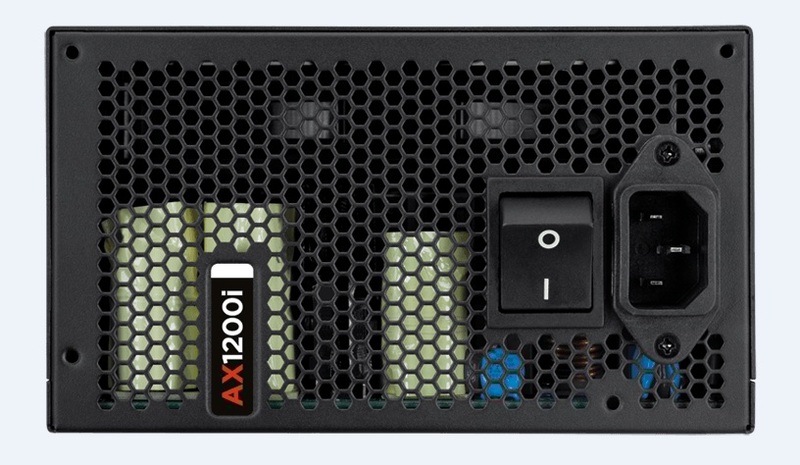 The DSP in the AX1200i makes on-the-fly adjustments for incredibly tight voltage regulation and clean, stable power. 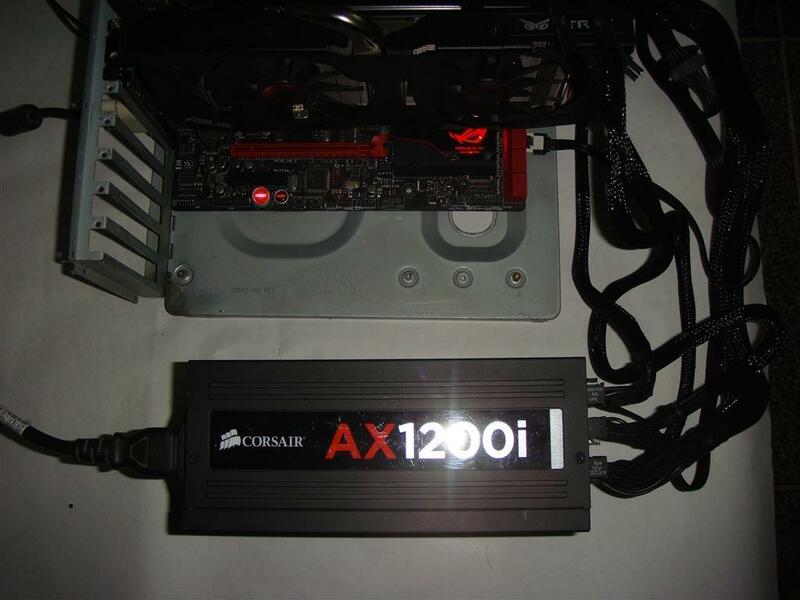 Now let’s see what this Corsair AX1200i has for us. 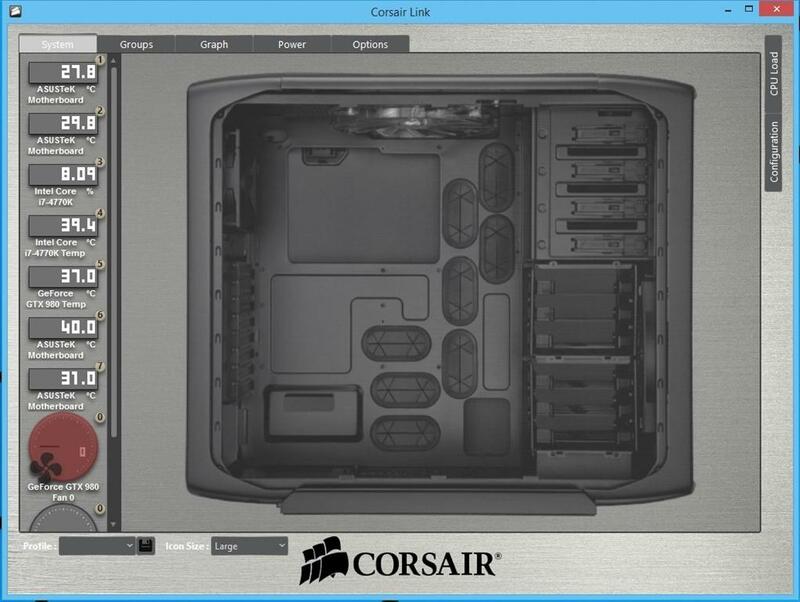 The Corsair AX1200i is a groundbreaking new design. It is a departure from traditional PSU designs and is packed with features that will make building your ultimate dream PC even more enjoyable. 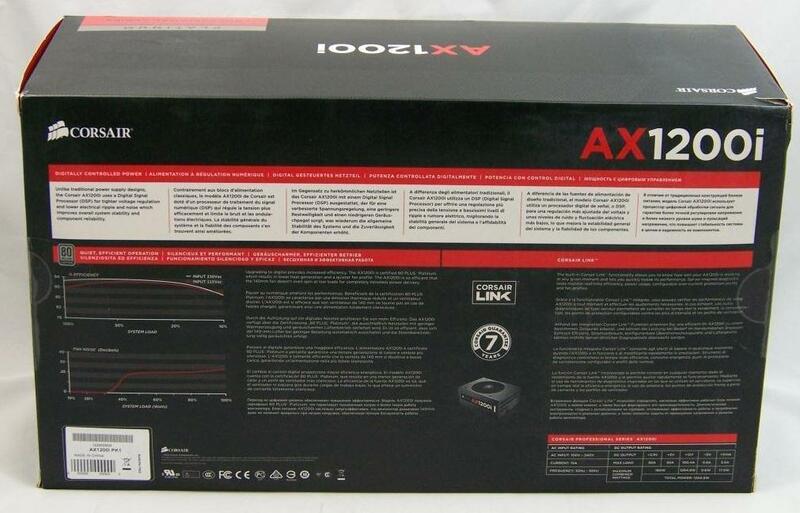 The AX1200i introduces some new and exciting technologies, so please read below for more information. 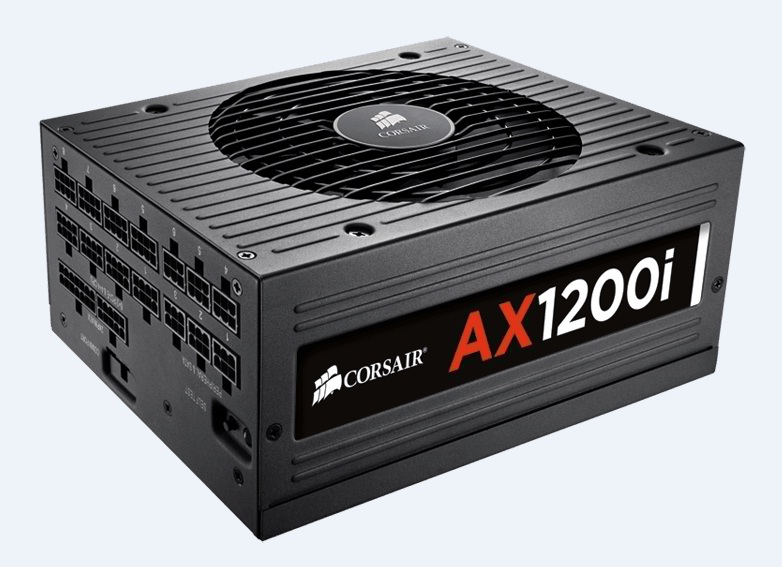 Unlike traditional power supply designs, the Corsair AX1200i uses a Digital Signal Processor (DSP) for optimized efficiency and tighter voltage regulation, which improves overall system stability and component reliability. Upgrading to digital provides increased efficiency. 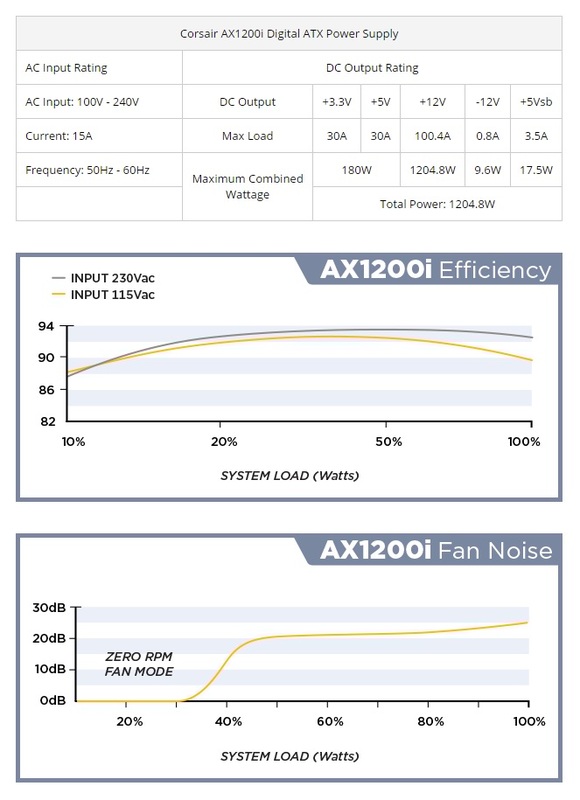 The AX1200i is certified 80 PLUS® Platinum, which results in lower heat generation and a quieter fan profile. The AX1200i is so efficient that the 140mm fan doesn’t even spin at low loads for completely noiseless power delivery. 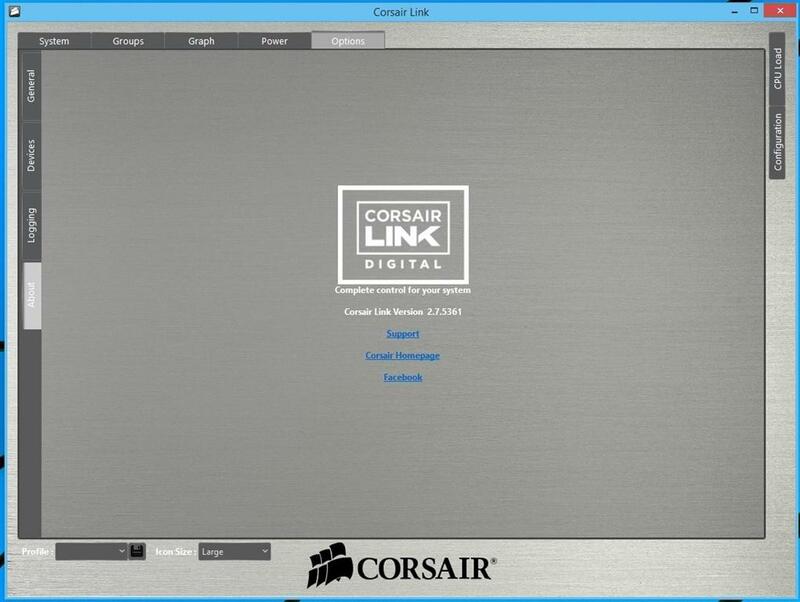 The built-in Corsair Link™ functionality shows you how your AX1200i is performing at any given moment and lets you quickly tweak its performance. Server-inspired diagnostic tools monitor real-time efficiency, power usage, configurable over-current protection points and fan profiles. 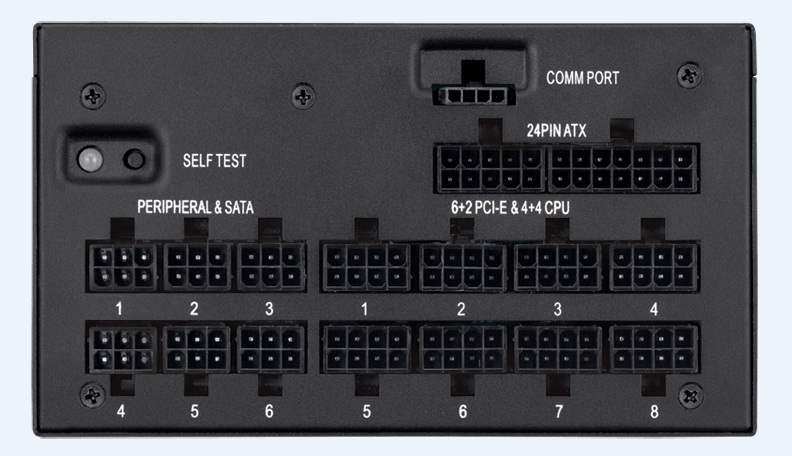 The fully modular cables make it easy to install and the self-test switch lets you quickly determine if the AX1200i is functioning normally before you even attach cables to your motherboard. The sophisticated electrical design, incorporating advanced hybrid digital control and state of the art magnetics delivers extremely high energy efficiency (92% and above). 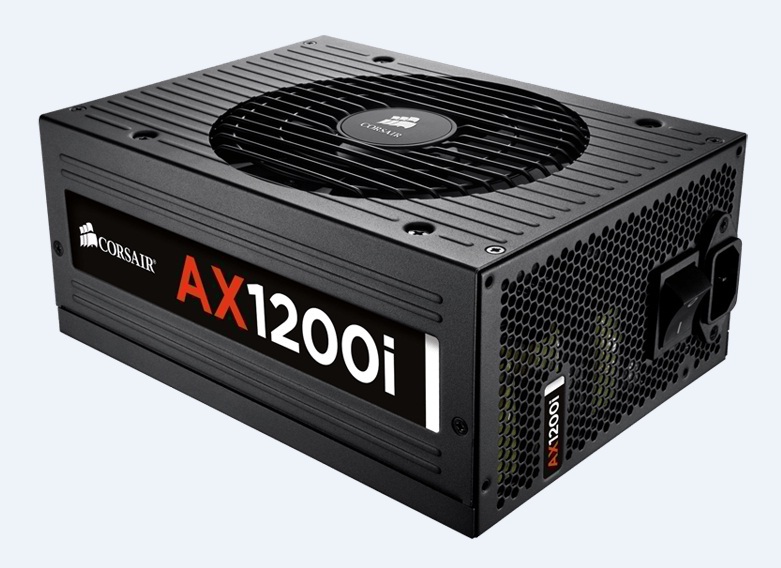 The AX1200i has a massive 100.4 Amp (1204.8 Watt) single +12V rail, which makes it the ideal power supply for ultra-high end multi-GPU systems based around powerhungry CPUs. 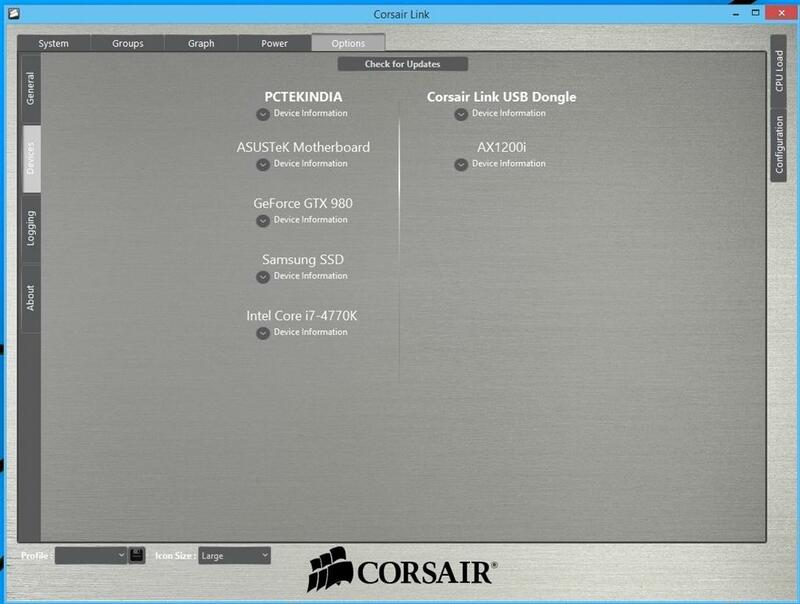 If you prefer multi-rail architecture, the PCI-E Over-Current Protection trip points can be configured individually via the Corsair Link™ Dashboard software. 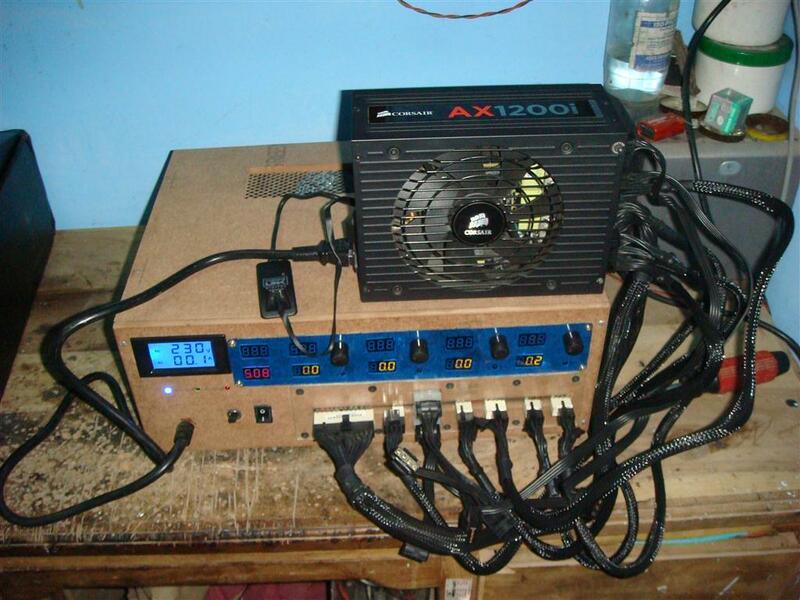 Due to its digital design, the AX1200i delivers exceptionally stable power over the whole load range and automatically compensates for DC output cable voltage drop, ensuring tight DC output voltage regulation without the ripple/noise, transient response, and converter stability drawbacks associated with conventional power supply designs. The AX1200i features individual DC-DC regulation for 3.3V, 5V and 12V rails, and secondary side synchronous rectification, utilizing MOSFETs that have lower losses than the conventional output rectification schemes. 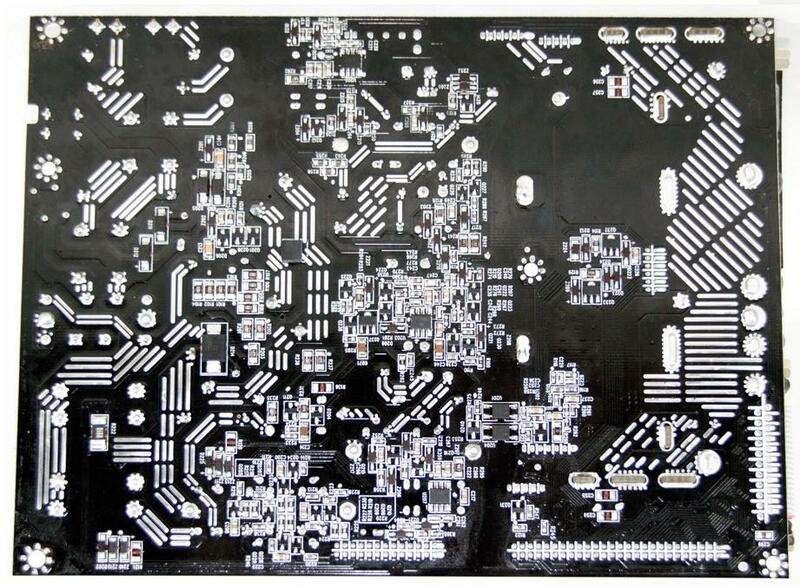 An advanced 4-layer modular connector board PCB ensures a better ground return plane, lower resistance and low voltage drops. 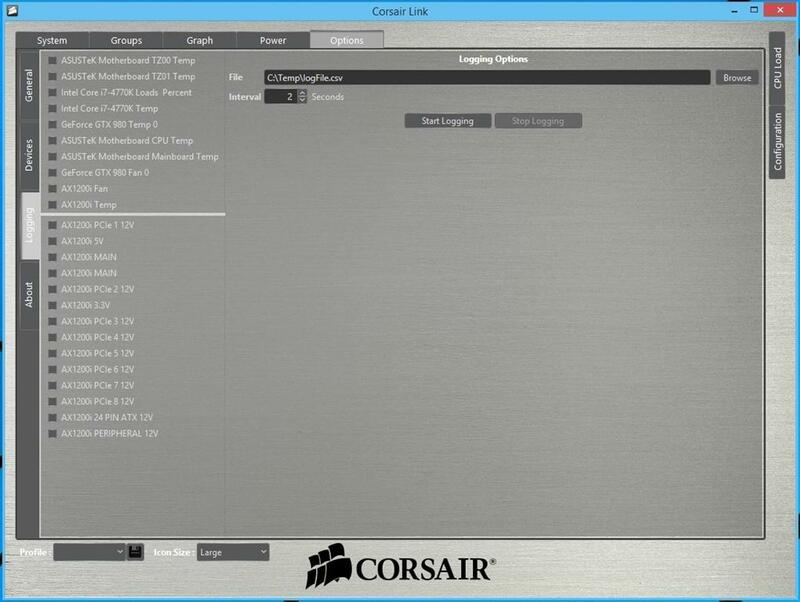 This, combined with circuit trace optimization and advanced filtering techniques, helps to minimize ripple and noise. 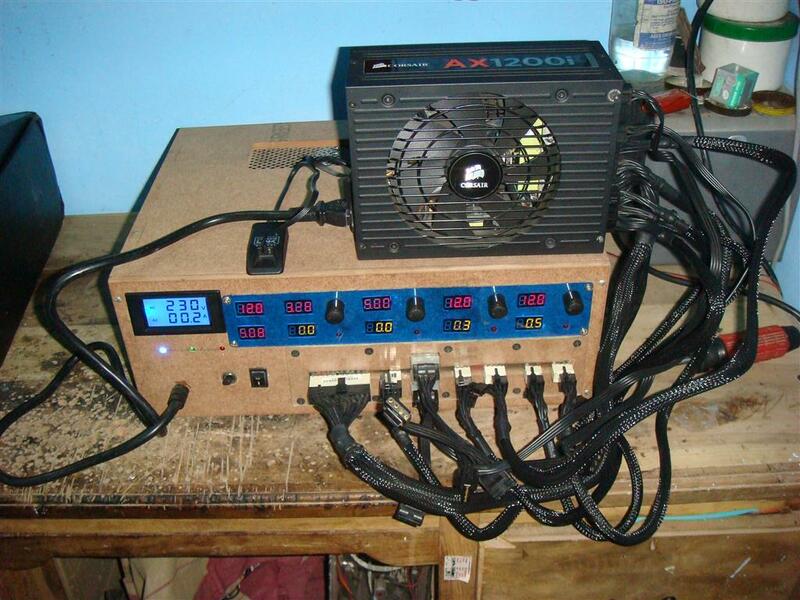 The digital control of the AX1200i eliminates many external components required by more conventional PSU solutions to offer an extremely small, high density, high reliability solution that allows incremental space to add extra features - like real time parameter monitoring and power supply control. The fully-modular, low-profile cable system provides maximum flexibility when building or upgrading your PC, and maximum airflow through your chassis. 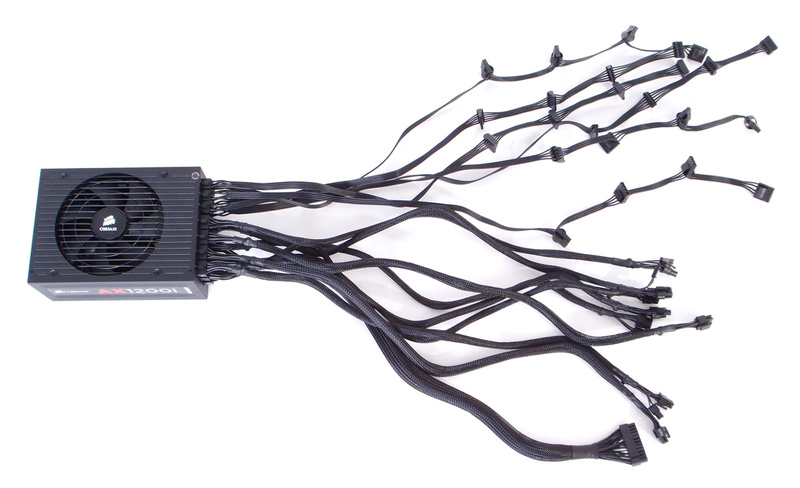 This allows you to utilize only the cables that you need, reducing cable clutter and maximizing the cooling performance of your PC. 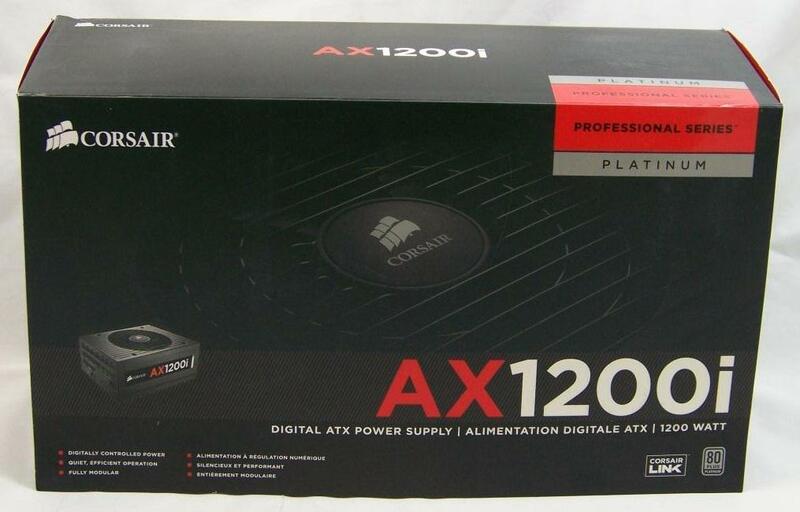 The AX1200i utilizes a low-noise, thermally-controlled 140mm fan, and employs sophisticated techniques to enhance cooling performance and reduce noise. This includes a specially designed PCB that channels airflow to reduce back-pressure and maximize the cooling effect of the airflow. The fan remains off under light load conditions and can be controlled via a graphical user interface. The power supply can be validated prior to system installation via a self test switch, which confirms all DC output voltage rails are present and the fan is functional. 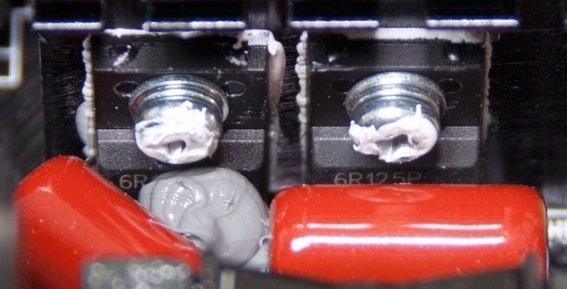 Over-voltage protection for the 12V, 5V and 3.3V DC outputs is required to comply with the ATX specification. 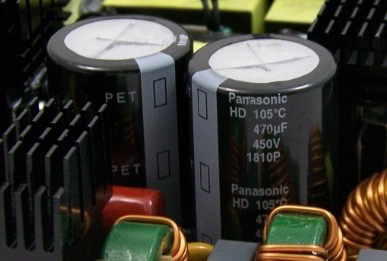 OVP shuts down the PSU in the event that the DC outputs exceed a set level, determined by the PSU manufacturer. The minimum voltage levels required for compliance are 13.4V for the +12V rail(s), 5.74V for the +5V rail and 3.76V for the 3.3V rail. 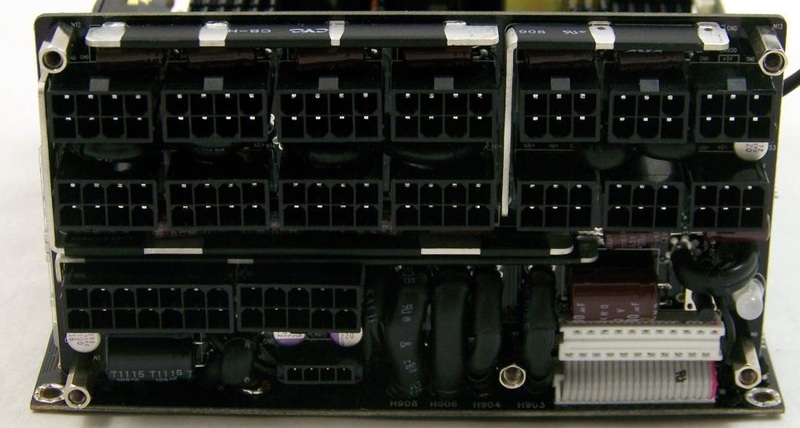 The AX1200i features OCP on the 3.3V, 5V and 12V rails. OCP ensures that the output of the DC voltage rails remains within safe operating limits. 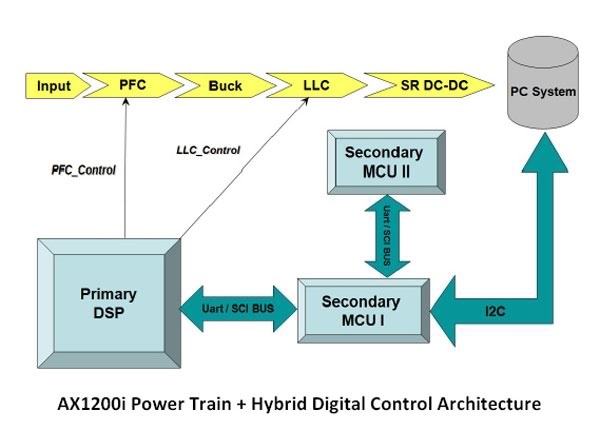 The AX1200i can be configured as a single rail or multi-rail OCP solution. 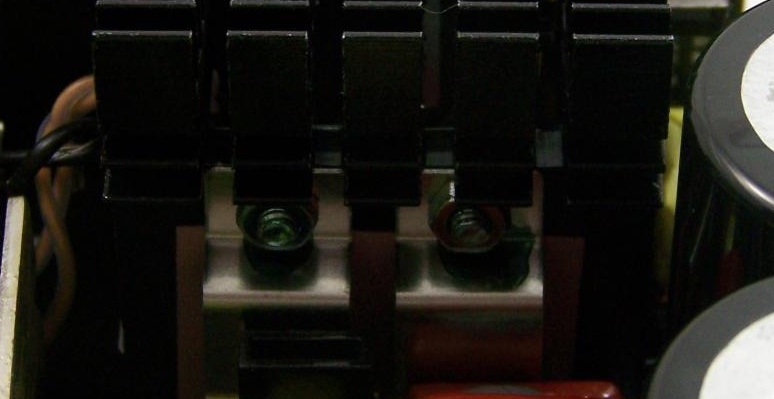 OTP ensures that the PSU will shut down when the internal temperature reaches a set point. This is usually as a result of internal current overloading or a fan failure. A short-circuit is defined as any output impedance of less than 0.1 ohms. Amongst other things, SCP ensures that the PSU shuts down should the 3.3V, 5V and 12V rails short to any other rail, or to ground. 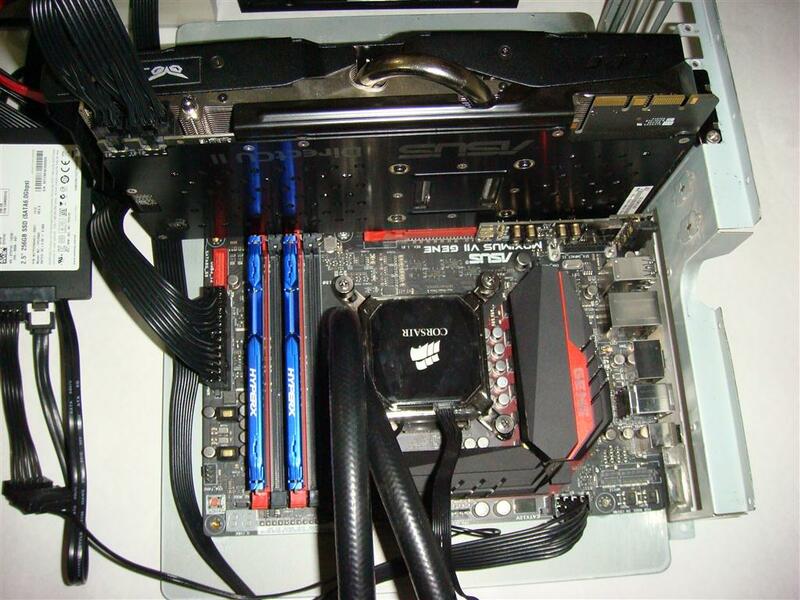 It also ensures that no damage should occur to the unit, or your PC’s components, in the event of a short. 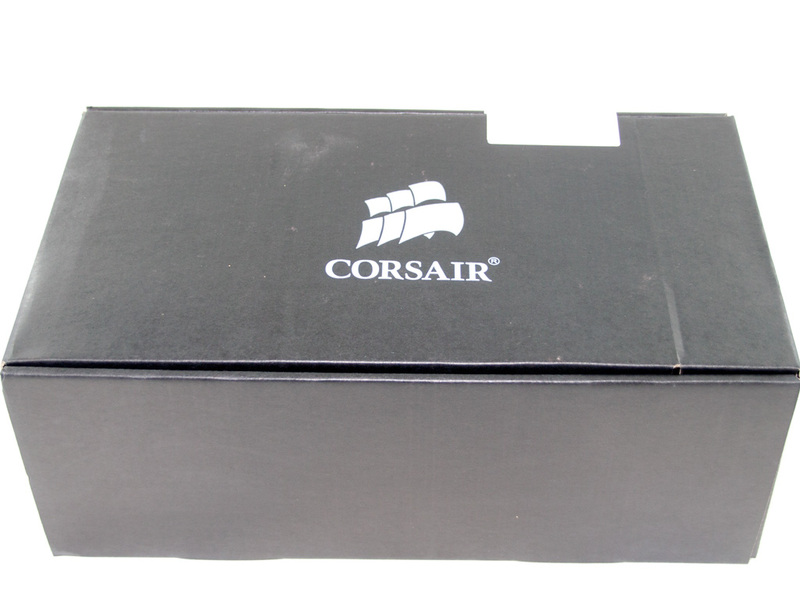 Corsair AX1200i comes in a box securely packaged with PSU graphics, Model name and features highlights on front and the back of the box. The lid of the box flips up to reveal a listing of includes cables and fundamental features. 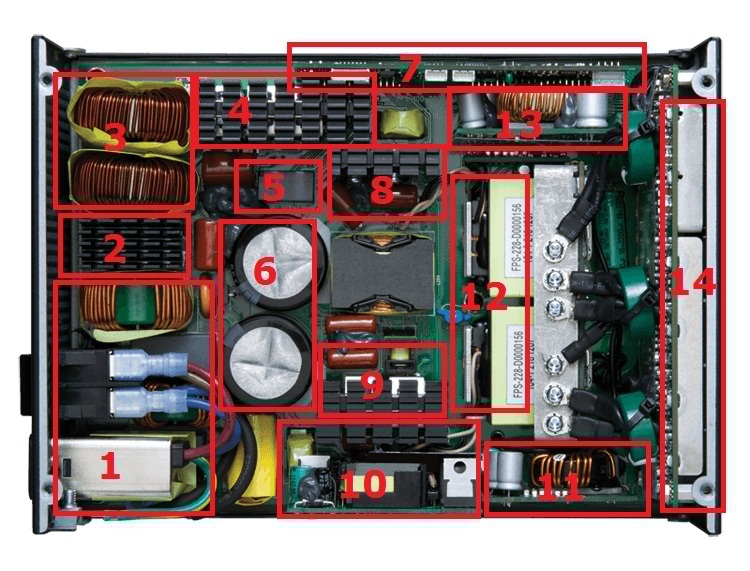 There is also a diagram of the PSU with various areas pinpointed. 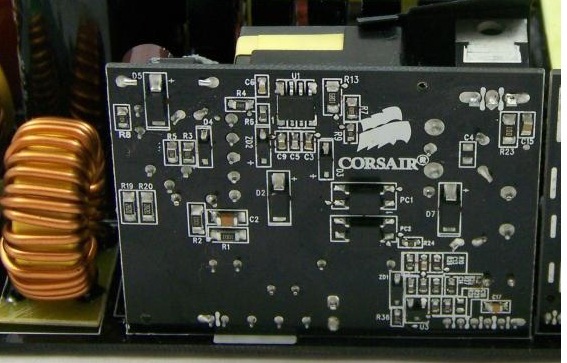 Corsair’s AX1200i power supply is built by the OEM Flextronics. A Digital Signal Processor (DSP) is used to manage the various components on the PSU where as on a normal PSU everything is controlled with analogue signals and monitoring IC. 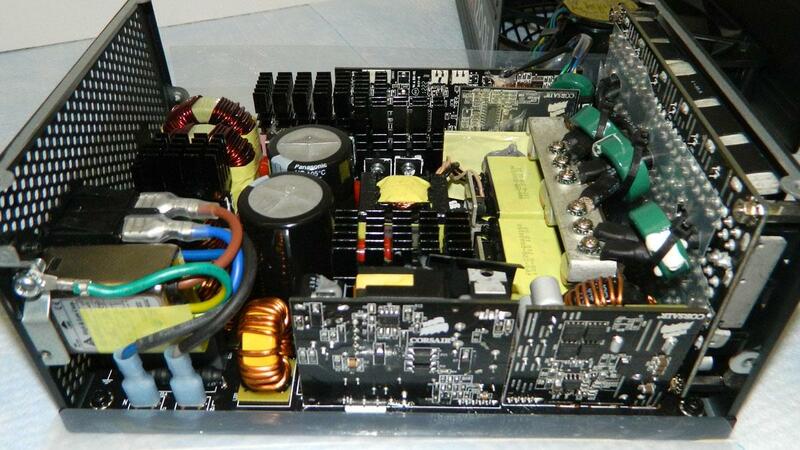 Cooling of this PSU is handled by a Yate Loon Electronics 140mm fan model no. D14BH-12. This fan is capable of up to 2800 RPM at 48.5 dBA with 140 CFM. 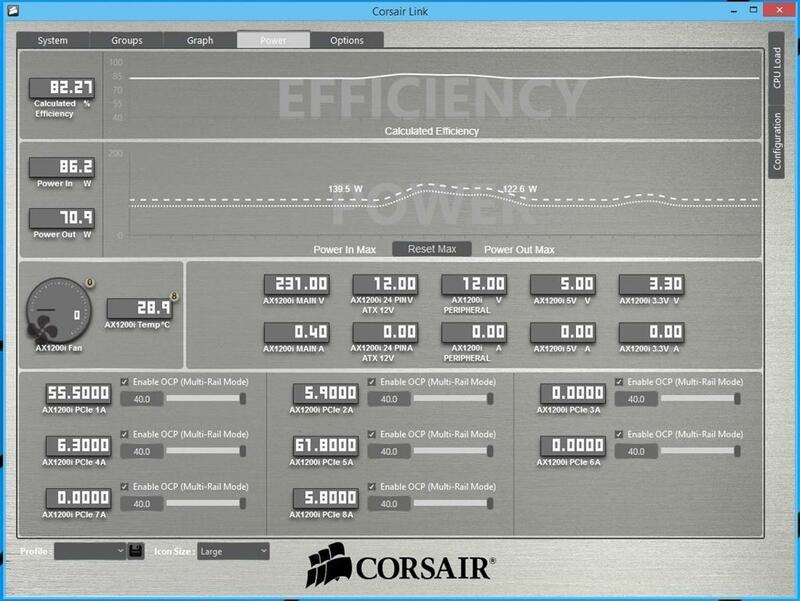 Corsair used this fan max at 1800RPM producing approx 91CFM and 31dB of noise at full load. 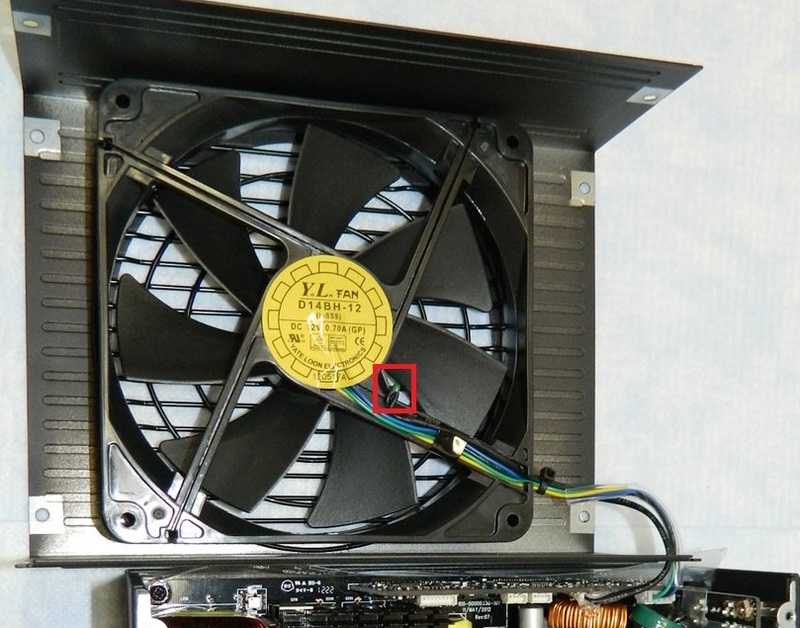 Finally a thermistor is also attached to the fan to monitor the temperature of incoming air, what the use of monitoring incoming air temperature when temperature rise is inside the PSU body; instead this themistor should be mounted on the exhaust grill to monitor hot exhaust air temperature and control the air flow accordingly. 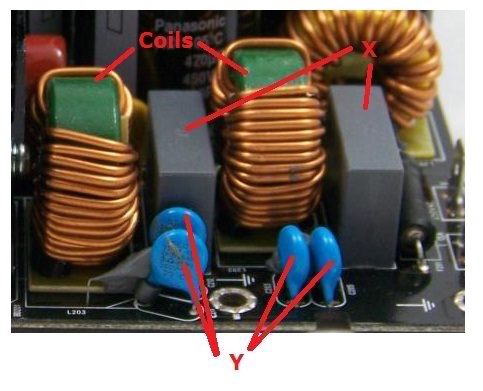 Update: After going through the layout of PSU controller, found that this thermistor on fan is used to calculate temperature difference and then after temperature coefficient. 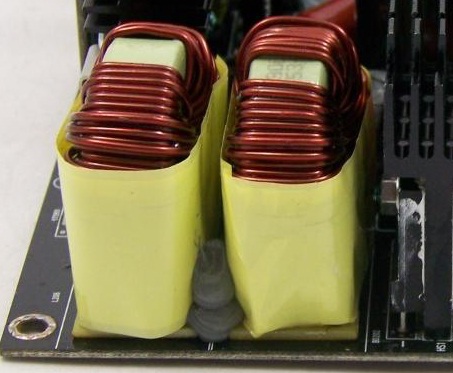 There are few more thermitors on the PSU which are used for thermal management. 1. Power Socket, Power Switch and EMC /EMI transient filtering stage with two coils, one MOV, four Y caps and two X caps. 2. 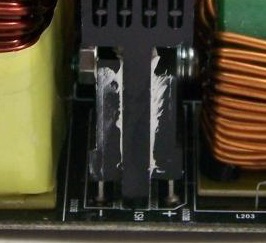 Two bridge rectifiers GSIB2560 in parallel on a heatsink. Each bridge is capable of handling 25A. 5. Power relay to turn on the main Power section as Computer is powered ON. 7. 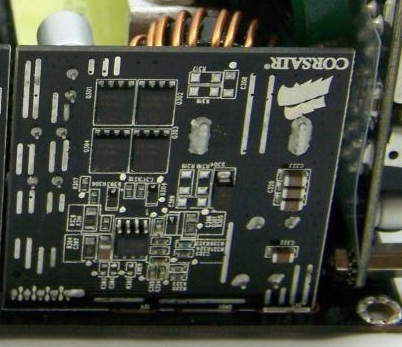 Main DSP Control board. 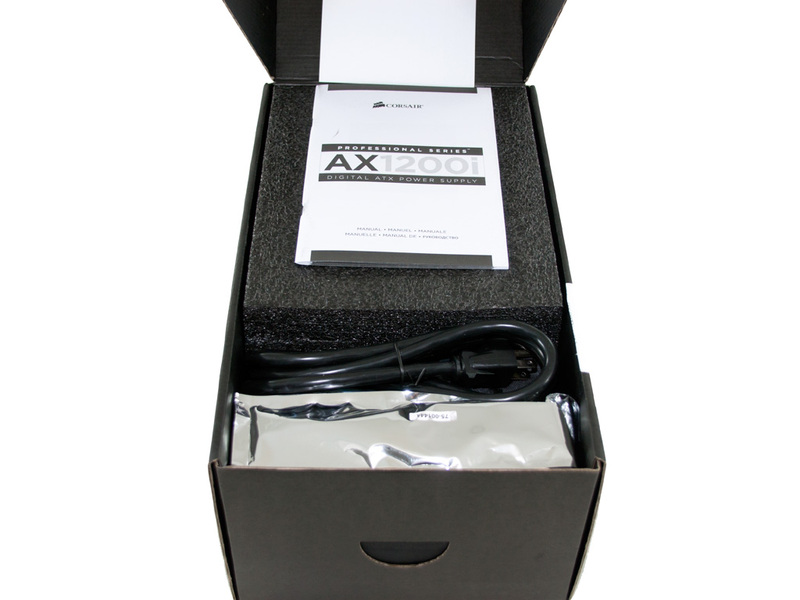 Ax1200i uses Freescale 56F8014 as its main Digital Signal Controller alone side two Silicon Lab, fully integrated mixed-signal System-on-a-Chip, MCUs C8051F380 and C8051F310. 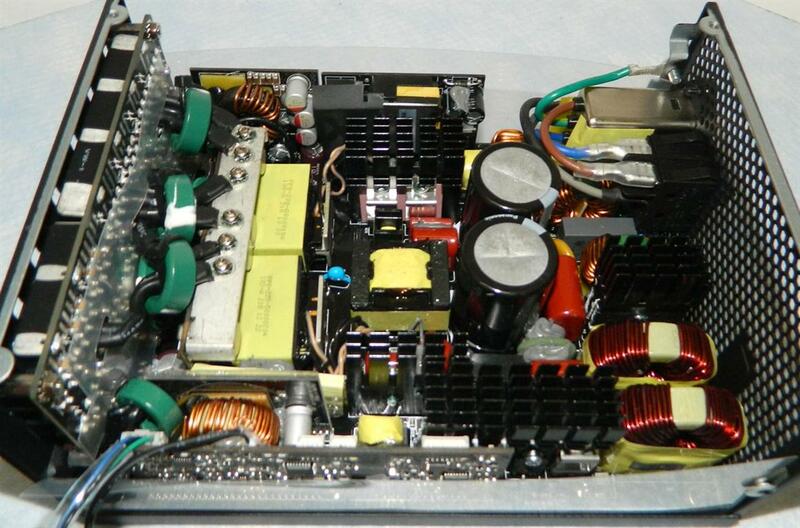 Main board also have several precious Texas Instruments LM2902K quadruple operational amplifiers. 9. Phase 2 LLC MOSFETs are four Infineon IPA60R125CP MOSFETs mounted on to the heatsink. 10. +5V stand-by daughter board. 11. +3.3 V DC to DC PCB, having four IPB042N03L MOSFETs. 12. 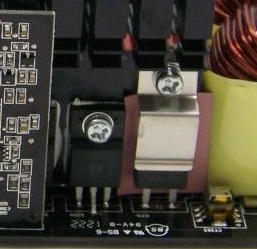 The two interleaved, parallel, main transformers for +12V with PCB behind holding rectifier MOSFETs and four FPCAP caps. +12v rail is transferred to the back modular connector PCB via six thick wires screwed on to copper bar with ferrite rings to suppress the high frequency EMI/RFI electronic noise. 13. +5 V DC to DC PCB. 14. Back modular connector PCB having few OS-Con, rubycon and Chemi-Con Caps for extra ripple filtration on different rails with thick copper flat strip type jumpers for high current rail distribution. 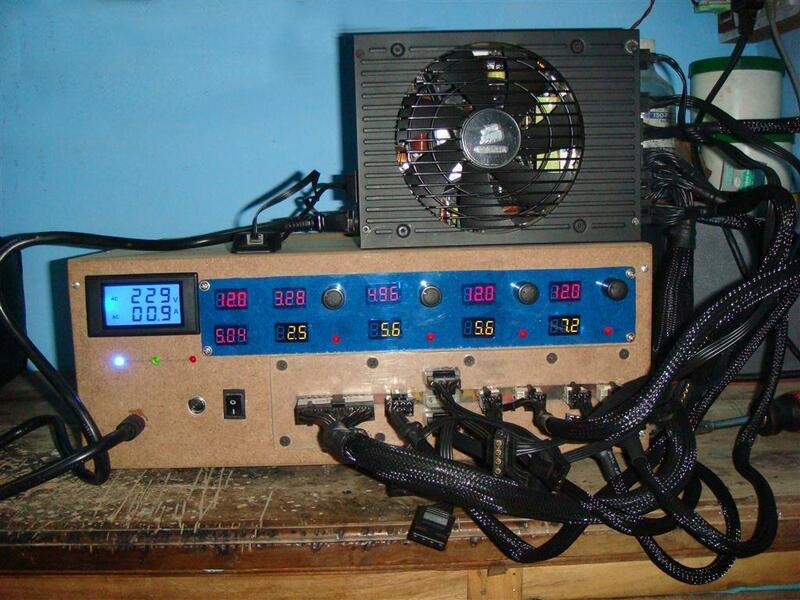 Custom made DC Active dummy load PSU tester. 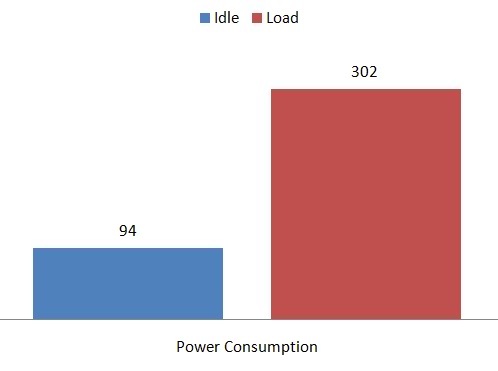 Pc power consumption, wattage reading as per displayed by APC Pro 1000VA (Model no. BR1000G-IN) UPS. 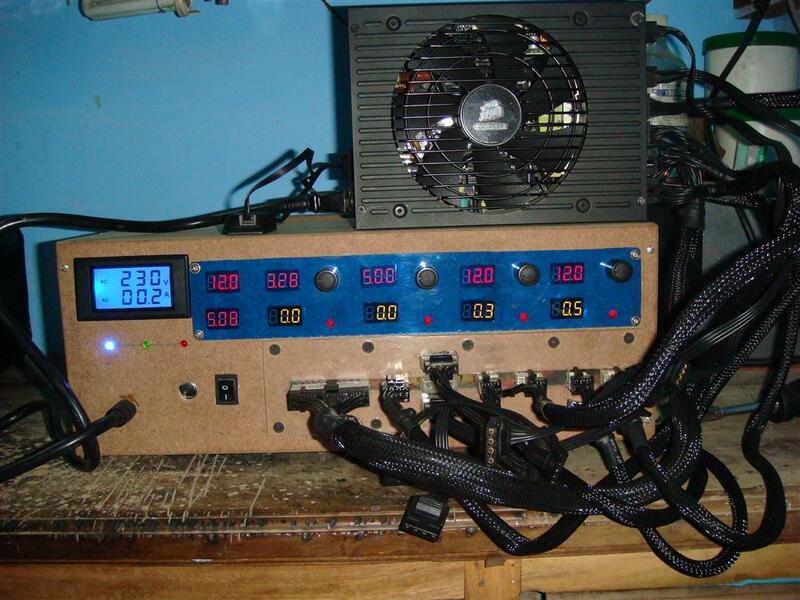 To test the PSU on my Active load test, I have manually increased the load in Amps on 12v first rail, 12v second rail, 5v and 3.3v rail to simulate 100%, 80% 50% and 20% load. Since this PSU is having only single 12v rail, so divided the load in half on both 12v loads on my tester. 5V stand-by and -12V supply was left at a constant 0.5amp load throughout the test run. Maximum theoretical load handling capacity of my tester is somewhat around 1500W, but due to MOSFETs safe operating area (SOA) characteristics and thermal load handling capacity of the heatsinks, this tester can handle Max 1300W.. For safety reasons I have also installed a thermal controller which turn OFF the attached PSU if temperature exceeds SOA specifications. 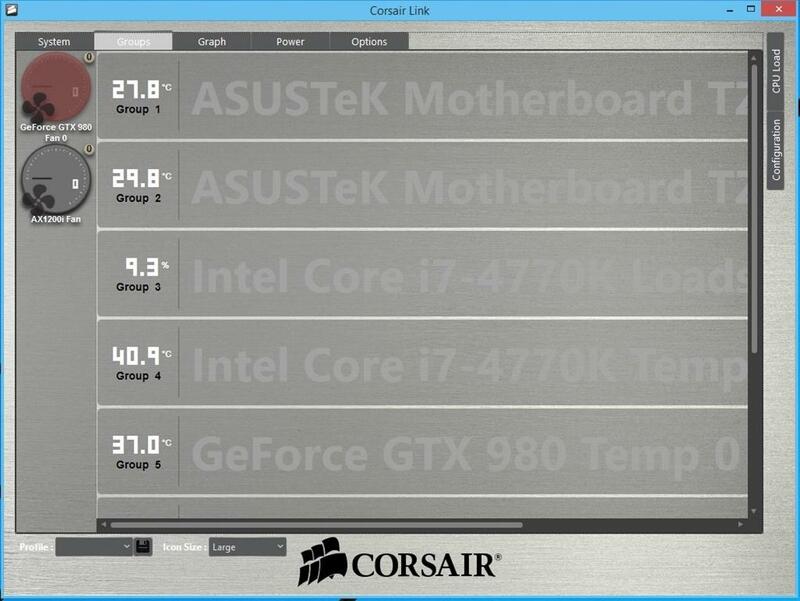 During test the tester turned OFF the PSU after approx 15 sec at 100% load. So was not able to perform any overload testing. 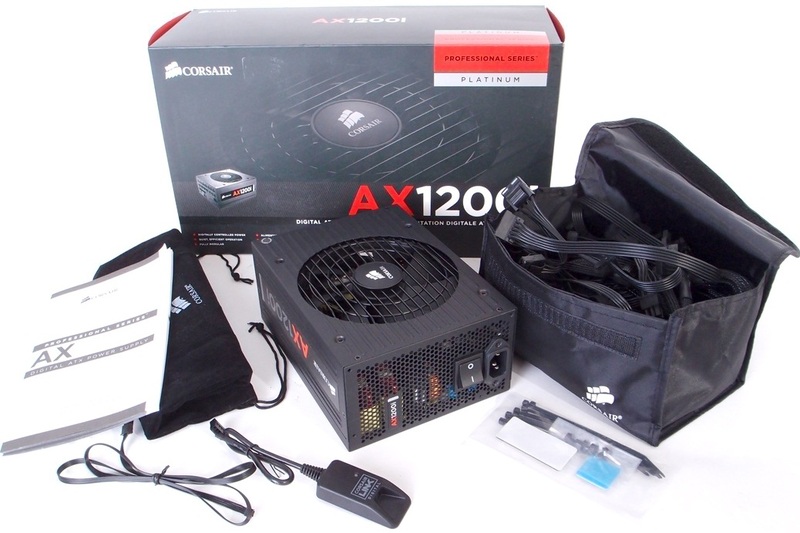 Corsair AX1200i is a powerful high-end power supply unit for enthusiasts satisfying their SLI or Crossfire needs and full fills 1200 W and 80PLUS Platinum specifications very well. 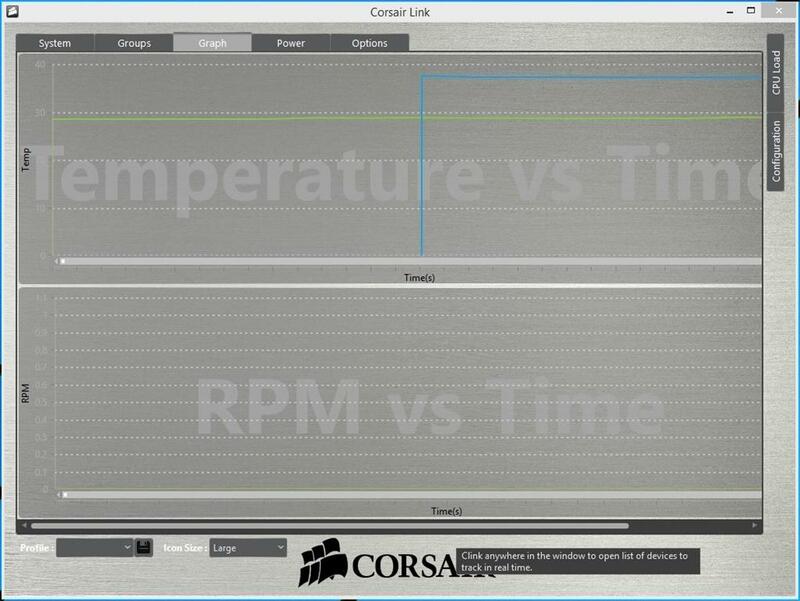 Corsair 'Digital' PSUs technology employs digital signal processors instead of traditional analog controllers for the utmost performance, efficiency, and low noise. 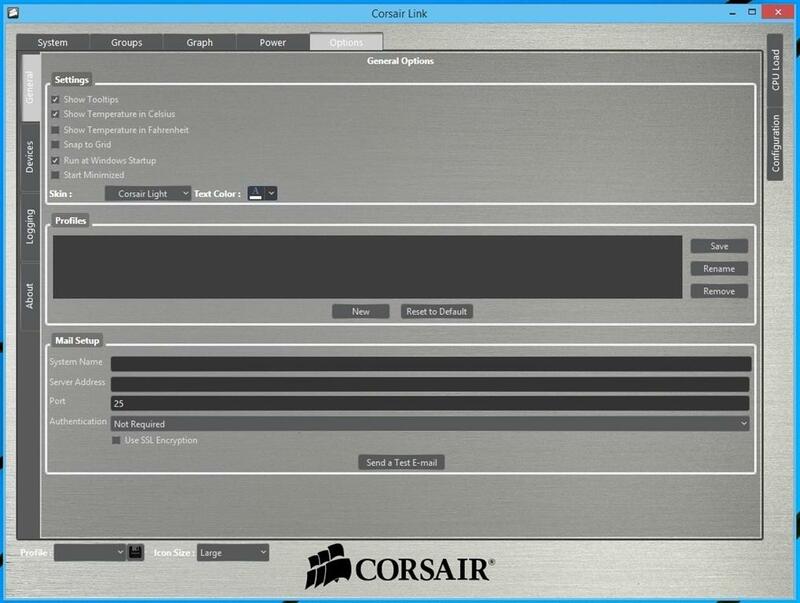 Furthermore Corsair added software using which you can monitor; in the real time, voltages, currents and power consumption of all the outputs as well as the AC input along with real-time efficiency reading of the PSU and you can also change different settings. 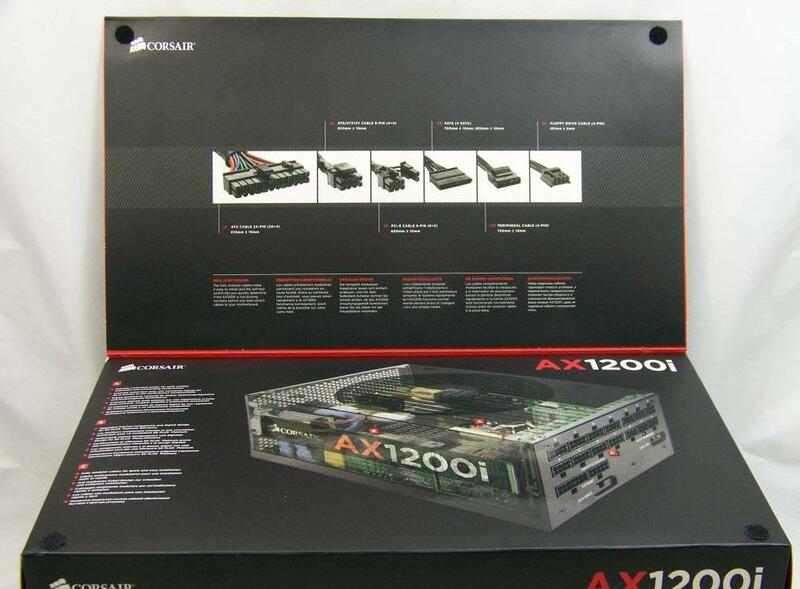 Over all the Ax1200i PSU is very extensive, but some users may wish to have eight instead of six PCI Express connectors of Quard SLI or equivalent. 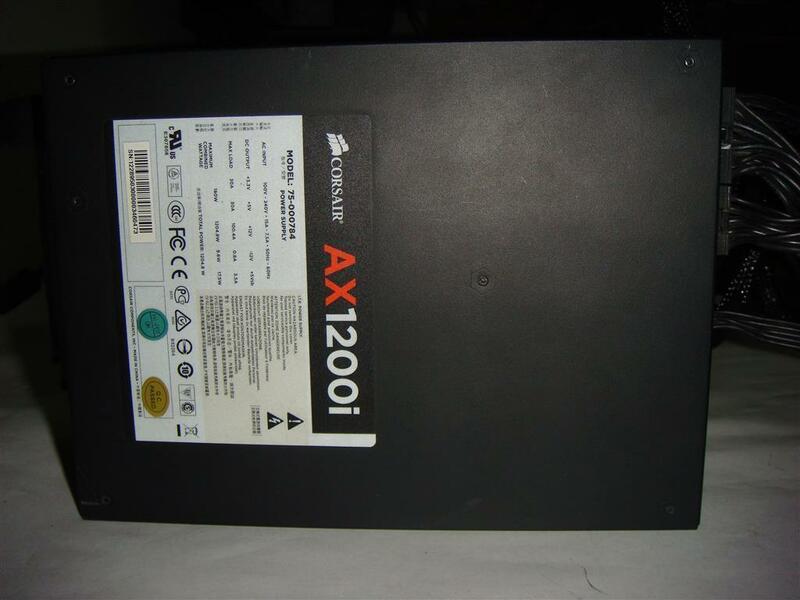 Finally if you are looking for a high power PSU with best features available, than Corsair AX1200i PSU is the best option for you.